Lawyers Abhishek Manu Singhvi and Arun Jaitley and industrialist Vijay Mallya, owner of the now-beleaguered Kingfisher Airlines, are the top three moneymakers among 92 Rajya Sabha members who have declared financial interests in business activities. The Civil Aviation Ministry has proposed a 24 per cent Foreign Direct Investment (FDI) in Indian carriers as against 26 per cent recommended by the Industry Ministry. A luxury bus carrying players of the Indian women kabaddi team collided with an Army truck near the Army Chetak Park on the Barnala road around 4 pm today. A Punjab Police Gypsy accompanying the bus was also involved in the accident. The drivers of the bus and the Gypsy were killed in the accident while 13 players and policemen were injured. The country�s Metro rail system is spreading its span with the Centre today announcing the modern transit system for all cities with a population of 20 lakh and above. 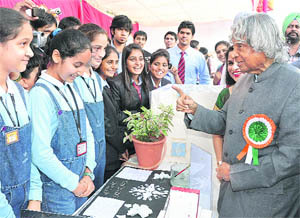 A nuclear-warhead capable inter-continental ballistic missile (ICBM) that has a range of 5,000 km was enough to watch India�s strategic interest, said former President Dr APJ Kalam while interacting with students of Chitkara University here today. The rules on civil nuclear liability which have been notified by the UPA government may figure during the bilateral meeting between Prime Minister Manmohan Singh and US President Barack Obama tomorrow in Bali on the margins of the ASEAN and East Asia summits. Amid reports of rising tension between the military and PPP-led civilian government over secret communications with the US in May, Pakistan President Asif Ali Zardari has met powerful army chief Gen Ashfaq Parvez Kayani twice in two days, even as Pakistan's envoy to the US Husain Haqqani offered to resign on Thursday.